This entry was posted on May 3, 2014, 2:20 am and is filed under Book Review. You can follow any responses to this entry through RSS 2.0. You can leave a response, or trackback from your own site. I’d never even heard of this author, but the review gives me high hopes that it’s going to be awesome! I’ll pick this up come pay-day, thanks for sharing! 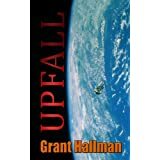 I hope you’ll enjoy “IronStar” and “Upfall,” Steven. Come back and let me know what you think.